A man named Matt has built a coffee table. It is designed to look like the Nintendo Entertainment System. It is awesome. Here is how it compares size-wise to an actual NES. The coffee table is bigger! This is more than an enormous Nintendo Entertainment System. It is an enormous NES with a fully functionally, jumbo NES controller. "Opening the lid reveals the storage for the controller, or even can store remote controls and game controllers in there for easy access/storage," Matt tells Kotaku. "The controller ports are actually two power outlets so I can plug in my laptop to charge." 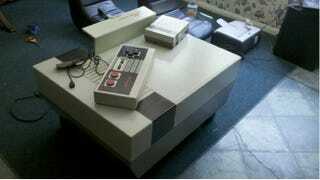 It is also possible to open up the back of the NES coffee table for more available storage space. Check out a video of the coffee table in action here.